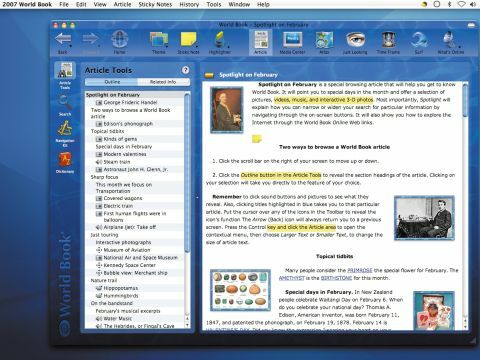 World Book is a digital encyclopaedia that comes with a renewable one-year subscription to free online articles. The application resides on your Mac and is updated over the web. Inside are around 4,000 articles, many quite short, and all seemingly aimed at school children in their early teens. Together with the text, there's good-quality video, images and audio content. Navigation is simple. You search for content from within the open application, then display the results either in a side panel or in little media browsers. Study tools, such as a Sticky Note pad and Highlighter Pen tool, are embedded in the header board of the main panel to help students along. The information in World Book has its limits. One of the first things you learn while exploring the adjoining www.worldbook. com is that without buying more access to World Book Online, you're only getting a fraction of the resources available . Then there's the competition. World Book's main rival is, of course, the internet - the home of more video clips, sounds, articles and sights than you can shake a billion sticks at. World Book tries to get you involved with its other paid-for resources, but why do we need to pay for what is clearly already online for free? We found more inspiring video and images of tigers and star systems on YouTube than World Book for nothing. And, regarding its articles, World Book only gives you one opinion on an event - go online and you can read around the issues. Protective parents will like the editorial control offered by World Book, as opposed to the random nature of web searches. But children aren't idiots, and as most of the English-speaking world does its research via free online resources, why can't they? So, it works well as far as it goes, but children over the age of eight will soon find it limited.